Meet Meaghan and Marie Wright, videographers and storytellers of Common Good Solutions. The set of twins graduated from Saint Frances Xavier University with business degrees, and found their passion for videography early on in first year. Upon graduating, the pair connected with Common Good Solutions (CGS). 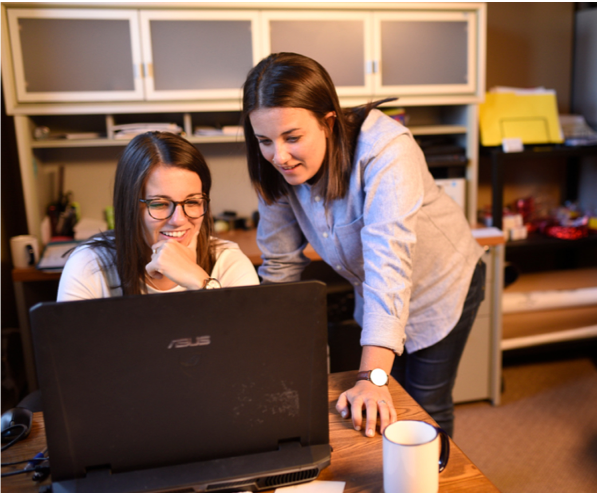 The GTO program offers a funding incentive for small businesses in Nova Scotia who commit to hiring recent university and college grads for meaningful jobs in their field. Nova Scotia employers who are eligible for GTO can receive up to 35% of the grad’s first year salary and 12.5% of the grad’s second year salary from the Province, while helping youth stay in Nova Scotia. Meaghan and Marie started off at CGS making online courses for social entrepreneurs. Then began to tell the stories of social entrepreneurs around Nova Scotia using their passion, video. “We realized there was a bigger story to tell,” says Meaghan. So they bought an RV in May 2017, drove across the country and interviewed 60 social entrepreneurs on the shift from traditional business to social enterprise. They called it: the Social Shift. “Our passion for videography over-lapped with the social purpose and environmental impact side of things, coming straight out of University, you’d never think you’d be able to couple both of those passions. If more people had awareness around Graduate to Opportunity, then more people would be willing and able to stay in Nova Scotia and do what they actually want to do,” says Meaghan. Both girls believe in the notion that a lot of young people today want to work for a company that aligns with their values, and want to see purpose and be passionate and excited about going to work every day. Stephanie Pronk, Director of Operations at CGS values the impact that the twins have brought to the workplace. About 80% of CGS’s employees are under the age of 30. When Meaghan and Marie joined the team the staff compliment was about 4-5 people. This has since grown to 21. Many employers appreciate young talent and the skills and qualities that graduates can bring to the table. However, hiring is not always easy. Stephanie believes that GTO provides the sometimes ‘missing link’ to connect grads who have no experience, to a meaningful first job in their field. Stay tuned on Twitter for videos about Meaghan and Marie, and other successful graduates who are building their careers in Nova Scotia with a little help from the Department of Labour and Advanced Education.